Dylan has been 4 for a week and a half now, and it still shocks me! I can't believe I have a 4 year old! Dylan's birthday was a great day! He woke up incredibly happy and excited for his birthday party. He spotted his presents, and kept begging his daddy to get out of bed so he could open them. Lexie was eager to give him the gift she picked out (with mommy's help, of course). Dylan loves his Matchbox Power Scouts Skull's Challenge set. As does Lexie. Finally came the big box from Mommy and Daddy. The look on his face as he spotted Spike the Ultra Dinosaur was priceless! He adores his new dino friend, and Lexie is in love with it too. The dinosaur got so much use at his birthday party that day, that we had to recharge the battery! 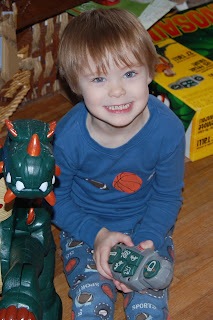 Okay, I'll admit that Grant and I love to play with the dinosaur too! Dylan had a big birthday party and throughout the day, we had over 60 people at our house. There were 15 young kids running around, and it was incredibly chaotic, but everyone had a great time! The theme of the party was Star Wars: May the FOURS be with you. Witty, huh? Dylan was spoiled by his generous family and friends. 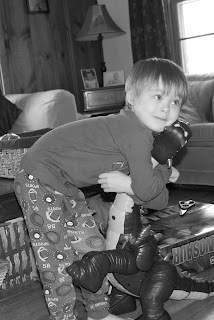 Some of his favorite gifts were the Leapster and games, Star Wars light up pajamas, Star Wars figures, Batman launcher, Shrek operation, Star Wars Light up shirt, Hulk Smash Hands, lightsaber, Matchbox Shark Rig, Matchbox Shuttle mission, Imaginext bat cave, Star Wars legos, and Playmobil sets. His room is exploding with toys and clothes. He adored the Star Wars cake that his Nina made him. He kept asking for the figures off the cake, so he was very happy when we finally sang to him. He spent the day playing with his cousins and friends, and fell asleep, as a very happy 4 year old, just before midnight. Our last guest left at 1 in the morning! Fun was had by all. I am so happy my little man had a great birthday! What a great birthday and a lucky little boy! I love the picture where he's hugging the dino and the one where he's opening it....the dog is just starting like, WTH? LOL Now Truett wants Spike!